That blessed day – the day that we can turn off the AC and open the windows arrived this last weekend. Cool fall weather in South Texas arrived in tandem with the notice from the city regarding brush pickup, so the neighborhood has been serenaded with the sounds of chain saws all this week. Receipt of the brush pickup notice meant for us that it was time to call the tree guy to come and take out two many-stemmed laurel-cherry trees, which had begun as a self-planted small saplings, grew into a hedge-like thing which screened my back yard from my next-door neighbors and offered a small touch of shade, and finally one of the two into a towering behemoth which banished direct sunlight from half the yard. Nemesis arrived promptly at midday on Friday, and before 4 PM the trunk and branches and all were piled up on the curb. 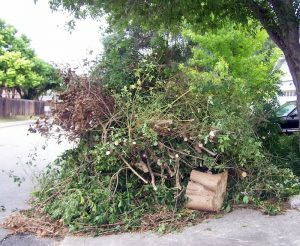 It is not quite the biggest pile in the neighborhood – but my daughter and I added some more to the top, by cleaning out some half-dead rosemary bushes in front, and pruning some particularly leggy roses. 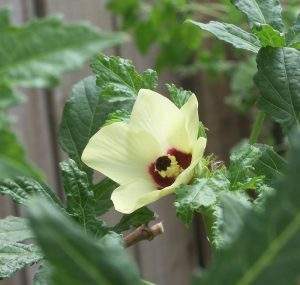 The big thing, though – was reclaiming the area which the laurel-cherries had shaded into oblivion, now that the sliver of potential flower or vegetable bed has been restored to sunlight. I originally had the idea to make that corner into a kind of outdoor parody- living room, centered around a small chair-shaped plant stand (which we rescued out of the bulk trash pick-up a couple of years ago (beating the metal scavengers to it by a short head) and a huge pottery chiminea (to which my daughter beat everyone else). And a small concrete statue of a sleeping cat, marking the final resting place of the much-traveled and much-loved cat who accompanied us from Greece, to Spain, to Utah, California and then to Texas. The chiminea has succulent plants in it – at some point when someday I am ambitious, I will replace with red and yellow chrysanthemums – to look more like fire spilling out of it, you see. It's a nice bit of garden art, anyway – and after drilling holes in the stump and pouring stump-killer and boiling water on it, we parked the chiminea on top and gathered all the other potted vegetables which have survived until now all around, on top of a nice layer of mulch. So much for the out-door living room parody – but it still looks incredible, done with the gathering of container-grown vegetables. And the sunny, suitable-for-vegetable growing space has been increased by about a third, now. When we hit Lowe's for the mulch – we also made the happy discovery that a lot of garden items like lattice panels were on sale for half off. 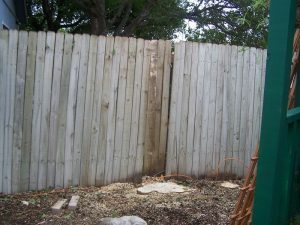 We had once had a lattice in back of the birdbath, to set off the space against the blank wall of my next-door-neighbors' house, and then for a time a trellis arch, until the weathering, wood-rot and a high wind broke it all apart. 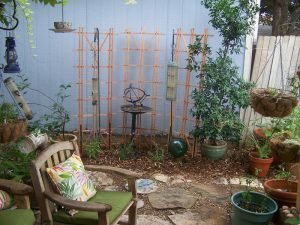 Three tall lattice panels and some odd plants made it into the car, along with the mulch – and now we have a nice little space defined by the lattice, the bird bath and two tall shepherd's crooks with bird feeders hanging from them. And that was my weekend – yours?